Trimming holiday carbon footprints and spending is a challenge we all face that never fails at Christmas time. Because of the typical temptations of the holiday season, it's hard to control expenses, which not only saves money, time and stress, but will reduce our carbon footprints as well. There are some things we can do to save the holidays from becoming unbearably expensive at this time of the year. Purchasing early and avoiding the last minute nightmare of deciding what to buy for someone is best. The prices won't have been increased yet so that saves money. You have time to really think about what you are buying for someone instead of loading them up with more junk they don't need. This reduces your anxiety when you give the gift, and their anxiety and bewilderment when they receive it. Whatever you decide to buy will give you a better chance of reasonable "choices" with alternatives instead of worrying about the gift not being available at the last minute. Christmas shopping after the holidays can be a good idea, and many people don't mind at all doing this. Usually the sales at New Years produce some gigantic savings on reduced items. There's nothing wrong with loading up and taking advantage of the Boxing Day sales for gifts for next year too. Again, the price is right plus you have the added time to think about what you are buying. Change your tradition of buying all gifts and try to make the bulk of your gift-giving homemade. Actually, this is tradition in many homes and cultures. Why not consider it as a great idea for trimming holiday carbon footprints at your house? Now certainly you can't hand-make your son or daughter the newest computer game, or make them the new boots they want, but you can replace many of the smaller gifts you buy in order to increase the quantity of what's under the tree if you feel the need. You know the old saying..."sometimes, less is more." Skip buying for "buying sake" and come up with smaller and less items that will be appreciated and treasured for the efforts made for a long time to come. When looking for cost cutting options, shopping online can be a good way to pick up your purchases. You may not get the experience of seeing the item for real at first, but at least you can do comparison shopping quickly without having to go anywhere and spend money on gas. Plan ahead for whatever you will be looking for and take advantage of the many deals to be had over the internet. Retailers online are in heavy competition, and that's good news for you the consumer. If the sky is the limit over the holidays at your house, why not trim the luxuries a little beforehand? 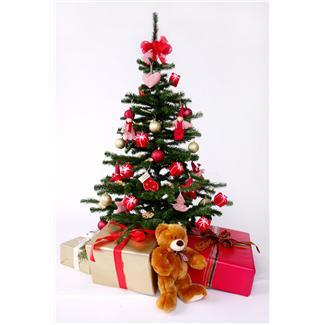 You can trim the luxuries at Christmas, but leading up to Christmas helps too. Why not start weaning yourself away from things you don't need? Cancelling little things like unread magazine subscriptions, ordering out for food, buying expensive toiletries you don't need, evenings out etc. can help alot towards your xmas shopping budget. Trimming holiday carbon footprints early can pave the way for a much greener lifestyle overall every day of the year.